It was a good Monday for Erick Wren. A really good Monday. 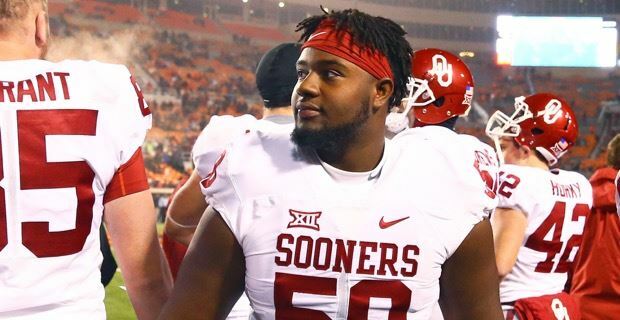 The OU senior offensive lineman got the surprise he had always dreamed of when head coach Bob Stoops announced that he had been put on scholarship in front of all of his teammates during an afternoon pre-practice meeting. "It was a great feeling. I didn't expect it to come like that," Wren said. "It came as a surprise and it feels good when all your hard work pays off. At that moment it paid off, but we still have to work for other things. That's just one of many goals accomplished. That's a major one, but I still have more." Offensive coordinator Lincoln Riley knows a thing or two about Wren's situation, as he too was a walk-on who played a season at quarterback for Texas Tech. Riley said experiences like Wren had Monday are just as rewarding for him as they are for the players. "It's awesome. This is a great moment for him," Riley said. "I take a lot of pride in it because I was a walk-on and I kind of know what that feels like, that struggle. To see a guy fight through all the things he's had to fight through and earn that is pretty special for all of us." A native of Mesquite, Texas, Wren began his career with the Sooners in 2015 after playing two seasons at Arizona Western Community College. He made his OU debut in the Sooners' first game of the 2015 season against Akron but saw playing time in just two other games. He never stopped working, though, and quickly gained the respect of his teammates and coaches. "He's really tough-minded and dedicated to what we're doing," Riley said. "He's a guy that you trust. It means a ton to him. He's fought through all kinds of things: injuries, not getting a chance, this and that, but he's always been there. "He's always made a steady progression. He's really taken to what Coach (Bill) Bedenbaugh has been teaching him, and he's just grown and grown." But Monday won't be the only impactful day for Wren this week. His development has taken him all the way to appearing atop the OU depth chart at center for Saturday's Big 12 opener at TCU. Wren says that scholarship or not, he wants to continue to be a leader for the offensive line unit moving forward. "Leadership comes from the heart. It doesn't come from your status on the team," he said. "I've always tried to lead that group of guys and spoken up when it was my time to speak up. You have great leaders in Orlando Brown and (Jonathan) Alvarez and Dru Samia, but when it's your time to speak up, you speak up whether you're a walk-on or on scholarship." Brown, Alvarez and Samia, along with countless other teammates, have become family to Wren during his time at OU, which was apparent when Stoops tweeted out a video of his announcement that Wren would be put on scholarship. His teammates — his brothers — celebrated more than he did, and Wren credits his success to them and his coaches for giving him the same opportunities even though he began as a walk-on. "These dudes and coaches have shown me and treated me like they treat everyone. They treat the walk-ons just the same, like family," Wren explained. "There's no separation in the locker room. We're one team. Win, lose or draw, we're brothers and they were excited because just like me they've been waiting on this moment for a long time." Said Stoops: "It's really great to be able to give a guy a scholarship when he's not expecting it, and when you know a guy's deserving. Erick has put in a lot of great effort and has really helped us. He's shown the stability to do the other things off the field, like in the classroom, to be a guy who's worthy of that. So you love doing it as a coach, and you can see the reaction of the players — they love seeing a guy get that reward."